The Brewmaster's Table: Discovering the Pleasures of Real Beer with Real Food is pretty much the definitive book on pairing beer and food. It was written by Garrett Oliver, the brewmaster at Brooklyn Brewery (and one of the all around classiest brewers out there, I don’t think many other brewers ever wear suits). The book is aimed more at the general beer nerd audience than it is a homebrew audience, but I think pairing homemade beer with homemade food is plenty of fun. 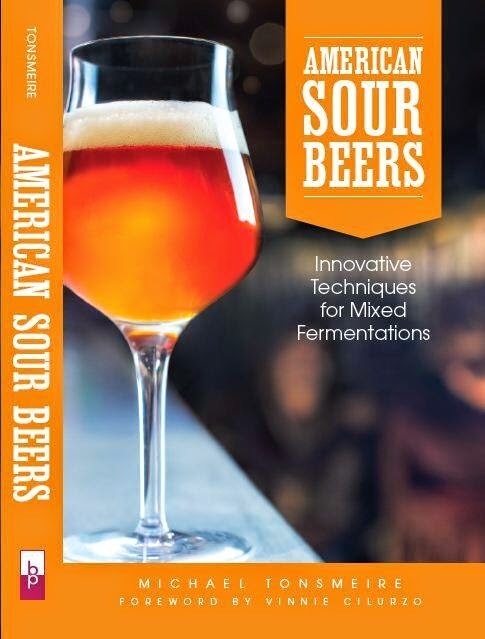 Content: The book starts out with a couple chapters on brewing ingredients and the history of beer. These chapters are fine and well written, but if you have read a couple homebrew books most of this will be a rehash. The third chapter lays out the basic principles behind matching beer to food. This is a inspiring chapter, with the author's pairings for a week’s worth of dinners particularly stimulating (like cassoulet and Sam Smith's Nut Brown Ale). The overall message is to decide to use the beer to either compliment or contrast the dish. For example complimenting a spicy dish with the spiciness of a Belgian Ale or contrasting a rich dish with a light/cleansing beer. One of the most radical sections of the chapter is on why beer is a better match for many foods (like chocolate, spicy food, or eggs) than wine. This chapter also covers matching beer with cheese, which is something I have really enjoyed. Almost the entire remained of the book covers different beers and what foods pair best with them. Pretty much every major beer style as well as most of the minor ones are covered. Each of these chapter covers a group of styles (Belgian Ales for example) starting out with a general overview of the common elements. After that each chapter covers the styles individually in more depth. The book gives a brief rundown of each style including the history/ingredients/culture behind it, followed by a couple pages on the best foods to pair with it (including most importantly the ideas behind the pairings), then finally a paragraph each on some of the most notable commercial examples of the style (and which foods pair particularly well with them). The lists of commercial examples aren't particularly in depth, but I think the idea of the book is to teach you the basics so you can figure out other pairings for yourself. The final chapter of the book covers proper beer service. This includes subjects like proper glassware, temperature, and tasting order. If they published this chapter as a pamphlet it would be perfect to give to a restaurant that puts plenty of thought into their wine selection/service only to offer a list of three beers served out of the bottle (or in chilled pint glasses). The very last section of the book is a terrific 7 page list of foods with the best beer styles to pair with each. It covers everything from mundane every day foods like burritos (American pale and brown ale, altbier, smoked beers) and chocolate (Sweeter fruit beers, imperial stout, stronger American stout, Baltic strong porter) to more opulent fare like foie gras (Sweet doppelbocks, sweet barleywines, off-dry strong dark Trappist or abbey ale, off-dry framboise and kriek, stronger Flanders red and brown ales, strong Scotch ales) and pheasant (Biere de garde, dubbel, strong dark Trappist or abbey ale, old ale, strong British bitter (ESB)). I often take a look at this list before picking out beers for a dinner party or just when grabbing a beer to have with a dish that I have never tried with beer. Certainly not every pairing I have tried from the list is sublime, but it does provide good general guidance (different examples of a style and preparations of a dish will pair better/worse with each other). The book also contains several very well done sections of photos interspersed throughout. Many of the photos feature foreign brewmasters, or beautiful shots of food and beer pairing from restaurants that take both seriously. Recipes: Sadly there are no recipes, but it is a pretty thick book already. 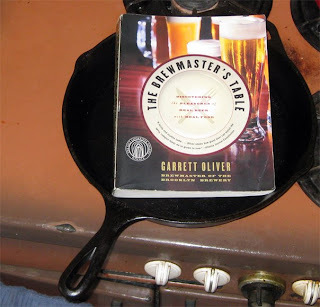 It would be nice to see another book tackle cooking with beer at the same range of simple to sophisticated that this one brings to pairing (too many beer cook books revolve around beer can chicken, or beer boiled brats, not that there is anything wrong with either of those things but they have been done to death). Accuracy: No complaints on the accuracy, it is a very well edited book, and I have not noticed any inaccuracies. Flavor and pairing are such personal things though that different people might think the suggested pairings are better/worse than I do. Readability: The book can be a bit dense to just sit down and read, but the reference at the end and the general structure make it easy to reference. After brewing a beer I often read the section on the style to give me some ideas of things to pair it with. The book is well written in general and just has a passionate feel to it. Overall: The Brewmaster's Table will make you excited to pair beer with food, even if you are just having takeout Chinese. I think this is a great book for anyone who wants to know more about pairing beer with food, beer nerds, homebrewers, or foodies just getting interested in beer. Are there any other great beer and food books that anyone else would recommend? I have plenty of cookbooks that have a few beer recipes, but not one that focuses on it. The picture is of a frisée salad with some awesome bacon (the dressing was just leeks cooked in the bacon drippings with a splash of sherry vinegar), poached egg, and some roasted tomatoes and potatoes. 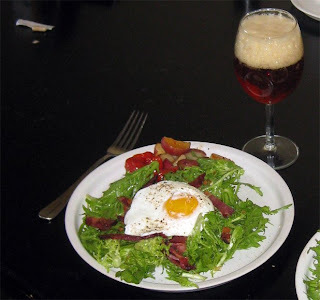 I went with Victory's (100% Brett) Wild Devil, a beer with enough dryness to cut through the richness of the egg and bacon and some bitterness to compliment the slightly bitter frisée. I thought the pairing worked well, but the beer was a bit more bitter than I think is ideal with a salad (even one as flavorful as this). Nice review Mike. I agree that this book could have used some food recipes. I'm sure that Garrett did not want to overstep his bounds or claim to be a chef, but I would have liked to see some simple and easy food recipes to go with easy to find commercial beers. Also, some specific brands of cheese to pair with a few commercial beers could have been great too.